For the past 4 years, we’ve been helping to solve for one of the most expensive challenges every businesses is sure to encounter — office space. Now, with the launch of our latest product feature, Connected Apps, we’re taking our service a step further by making it easier for hosts and guests to share in-office resources. Think of Connected Apps as your office manager’s best friend. With Connected Apps, PivotDesk hosts can automatically connect guests to critical office resources such as Meeting Room Scheduling with Google Calendar, Office Door Access with KISI, and inter-team chat features from one easy-to-use place. Before we get into the details of Connected Apps, let’s start with the why. 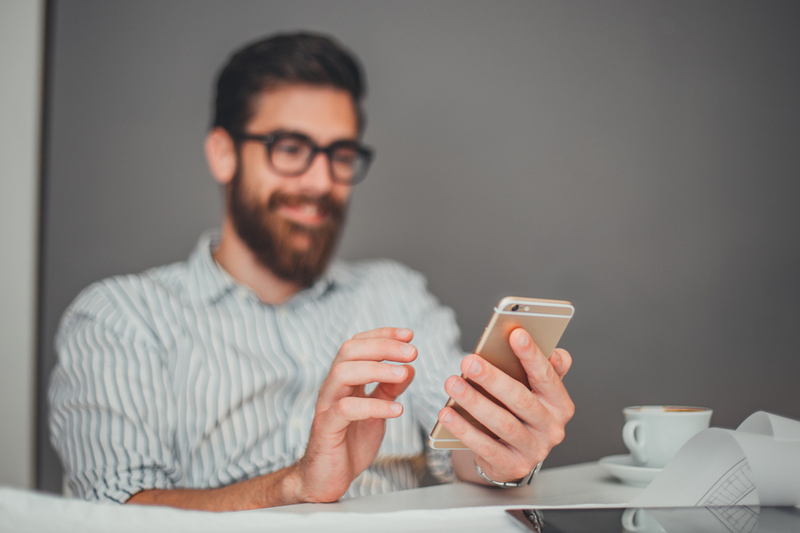 Why did we devote massive amounts of time and developer resources to building out a set of apps to help our guests and host companies improve their office sharing experiences? Simple. Our customers asked for it. As the VP of Product and Customer Success, I spend most of my time talking with PivotDesk users — and what I heard again and again was that the while platform made it easy for guests and hosts to find, book, and manage space, we weren’t doing enough to help them share critical office resources. And that just wasn’t going to cut it. The modern workers who make up our customer base are evolving. And while PivotDesk customers can vary from t-shirt wearing software engineers to business suit-clad investment bankers, the one thing they all have in common is the need for workplace connectivity. So, once we had a detailed understanding of the gaps in our product, we got to work building a solution that would extend the value we deliver to our customers far beyond move-in day to fill in those gaps. And thus, Connected Apps was born. So, what exactly is Connected Apps? Let’s start with what it is not. Connected Apps is not an App Marketplace like Salesforce’s AppExchange or Apple’s App Store. Don’t expect to log into your PivotDesk dashboard to see an overwhelming list of apps and tools to choose from. Instead, Connected Apps is a carefully curated list of tools that enable our customers to take advantage of critical office resources with just a few clicks so they can stay focused on what matters — growing their businesses! To start, we’re rolling out Meeting Room Scheduling with Google Calendar and Office Door Access by KISI, with more apps going live in the upcoming months. PivotDesk users can log into their accounts right now to view and enable Connected Apps for guest teams. With Meeting Room Scheduling by Google Calendar, hosts can automatically share meeting room calendars with guests without having to share an internal network or deal with setup. Why we’re excited about this: Anyone who’s ever ended a conference call awkwardly due to a conference room dispute knows how important efficient meeting room scheduling is to running a connected office. But when you’re sharing an office with multiple companies, the issue of clear conference room scheduling becomes even more touchy. 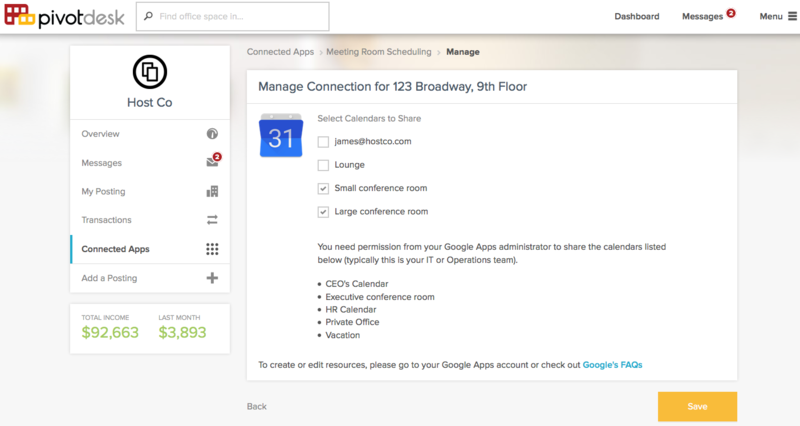 Meeting Room Scheduling by Google Calendar allows guests and hosts to view and book meeting rooms using shared calendars without the risk of sharing passwords or internal network information. The best part? Once a host company enables Connected Apps, the platform automatically manages guest access to all shared calendars from move-in day to move-out day. With Office Door Access by KISI, hosts can easily and securely manage office door access for employees and guest team members alike. Get rid of your key fobs (if you haven’t already lost yours) and use your smartphone to unlock office doors from near or far. Admins can easily share “keys” with employees and guests, monitor access logs, and unlock the door remotely. 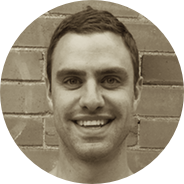 Learn more about how KISI is changing the way we think about office access! 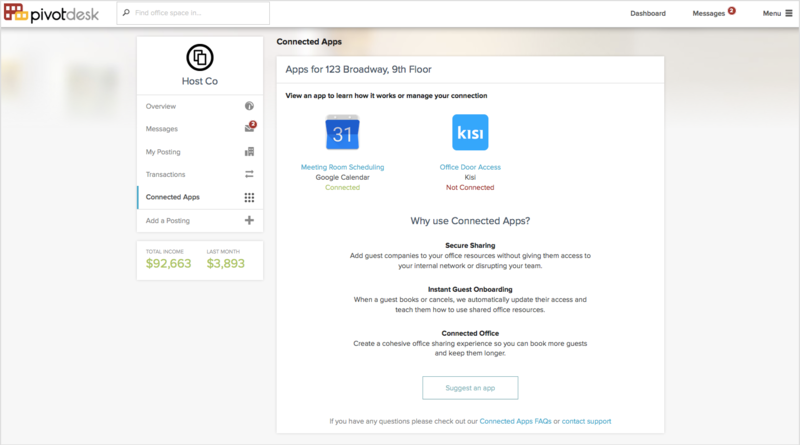 Why we’re excited about this: One of the most common questions we hear from host companies is “how do I ensure my guest company has access to my office space without putting my space at risk?” By integrating with KISI, PivotDesk now provides an easy way to control who has access to your office and when, eliminating the need to pass out physical keys or leave security up to luck. And on the flipside, guest companies never have to deal with the hassle of gaining access to their shared office, paying for lost key fobs or worrying about accessing their belongings after hours. If you currently PivotDesk space, log into your dashboard now to enable Connected Apps.